Rate this Article Experiencing virtual reality using a headset is good and all, but if we are ever going to experience "true" VR, we'll need to engage all of the 5 human senses... and FeelReal intends on tackling one of the toughest senses - the olfactory senses. You stumble your way across a desolate war zone. The street is deserted and littered with debris, dead bodies everywhere and everything around seems to be on fire. Of course you know this is just virtual reality and you’re actually in your room seated in front of your pc but somehow, you can feel the heat and the smell of burning rubber. As scents of the charred ground assault your olfactory senses, your actual physical self is still in your living room and you are wearing 3 things; a VR headset, a pair of 3d audio earphones, and the FeelReal VR mask. You are fully immersed in the game as your visual, audio, tactile and olfactory senses come together in experiencing this single virtual reality. This may sound farfetched but VR companies are currently working hard to bring this scenario into actual reality and they are getting closer and closer by the day. One of these amazing technology include the FeelReal VR mask. FeelReal is a VR mask used as an attachment to a VR headset that provides the necessary artificial scents or combination of smells to the nose as well as tactile feedback to the face like heat, water vapor or a cold breeze depending on the virtual game environment the player is currently immersed in. The concept of using artificial scents to enhance the visual experience isn’t new. Back in the 1960’s, it was adapted to a film being shown at Chicago’s Cinestage Theatre where German film technician Hans Laube installed plastic tubing underneath that expelled a combination of 30 odors triggered by the movie’s soundtrack. Laube called it the Smell-O-Vision. Unfortunately, the loud hissing from the tubes, the uneven distribution of the scent throughout the theater and the continual loud sniffing noises from the audience ruined the entire experience. The FeelReal VR mask somewhat operates on the same but far more advanced principle. 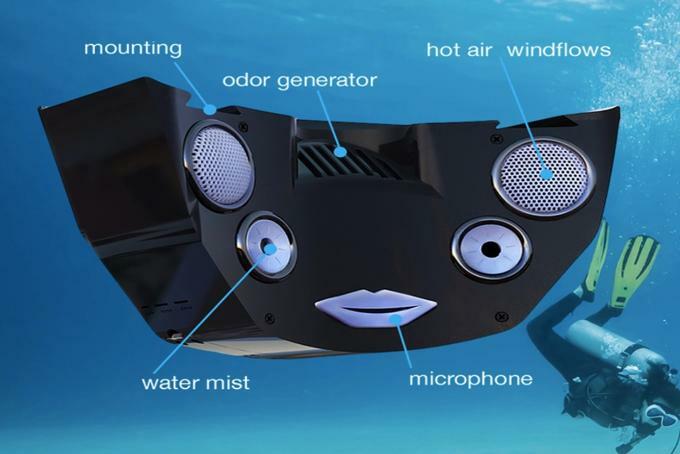 The mask contains a microphone for communication, a combination of an air vent for the various smells, a micro heater and cooler to simulate heat and cold air, haptic/tactile motors for force feedback and an ultrasonic ionizing system that simulate tiny water droplets striking your cheeks. The heart of the unit is its scents delivery system consisting of 7 different small odor cartridges that gives the smell of the Ocean, the Jungle, Fire or burning rubber, Grass, Flowers, Metal and Gunpowder. One of these smells or a combination of them is sprayed on your nostrils depending on the VR game you are playing. The company announced that they can also manufacture and provide certain custom smells should game developers require of it in the future. As to how the mask will affect VR gameplay, only time and a lot of testing will tell. User experience ranges from actually smelling a rainforest, getting wet and cold from a blast of cold air - the actual feeling of water droplets hitting one’s cheeks - to hot scorching air and the terrible suffocating smell of burning…chocking the air out of one’s lungs. The importance and benefit to Virtual Reality and gaming would be apparently so that the player will come to a point where it would be difficult to distinguish the virtual world from the real world as everything perceived becomes so realistically an alternate reality. This is of course the ideal expectation every 3D gamer and user would want to be immersed in. However, the realm of true 3D Virtual Reality is very much at its beginning stages and a number of limitations still have to be addressed. Unfortunately, there is even a possibility that the mask may cause some users to actually puke, especially those with medical conditions and very high-sensitivity to smell. The feeling of nausea can be heightened by a combination of the scents and the visual-vertigo inducing effect of the 3d lenses as some testers have already complained about. These are just but a few examples. Technically, the intent to deliver an extended VR experience bordering on the actual simulation of as realistic virtual reality makes sense and can be understood, but things don’t exactly go the way they should when put into actual practice. This however gives the developers of the device a chance to continually modify, improve and apply the smooth and finishing touches needed to come out with a great and successful product. As of present, FeelReal VR mask is still very much in its beta stage despite prototypes available for testing and use, and it is very likely the mask will stay that way for quite some time. Although the product, especially the concept, has a huge potential as far as VR-related gaming is concerned, you won’t be able to purchase a FeelReal mask any time soon. This is evident during FeelReal’s unsuccessful Kickstarter campaign last year, which is mainly because of the concerns some people have against the device. As of now, an extensive beta testing, troubleshooting and refinement of the mask is needed to eliminate or at least reduce the possibility of someone literally choking or puking. That said, let us all wait patiently for the developer to provide further announcements when the time is right and the product is completely certified, safe and ready.